The McAngus burger is indeed a master deceiver of epic proportions. When you eat it, it tastes fantastic, you are sure that’s it’s doing your body good. Instead, this burger filled with sugar, additives of the unnatural kind, flavours, fat (of the saturated kind), and colours (over 100 ingredients in all), mark my works, will send you to an early grave. In the following sections I will show you the how and why of this burger and why avoiding it will give you a longer, healthier life. An independent expert report released by the World Health Organisation which gave guidelines on health and intake of food and nutritional, amongst other things, set out recommendations on Sugar, Salt and Fat intake. With over 20 additives just in the burger, (plus the old Caramel IV rearing it’s ugly head). These figures below are recommended intake according to the World Health Organisation. Another thing to note is that these are gross caloric values and don’t take into consideration the usable calories from the body, I’m not sure if the WHO take this into condieration, so I’m not, but actual values may be 2 or 3% lower if this is taken into consideration. And all of this with little real nutritional benefit to your body, you will still need to eat enough fruit and vegetables etc, to make up therest of the calories that are recommended without eating any more of anything that is over the 100% mark already. I guess the graph speaks for itself on what, and where, you should be eating. Now, you may think this is a bit harsh, calling the Angus burger a heart attack in a box and saying that your better off eating the box than eating the burger. 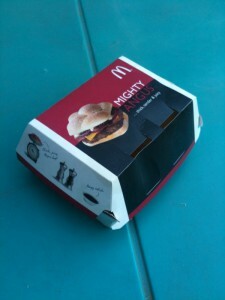 But lets say you do eat the box instead of the burger, how much less Saturated Fats, Sugar and Sodium are going to eat. For someone to have a healthy day’s eating, you simply cannot eat a meal like this and stay within your recommended daily calorie limit (or any other limit, for that matter), unless you are already overweight. SO that begs the question, how or why could anyone justify eating such a meal, ever! And how if this is all people should eat in a whole day (or day and a half), with very little nutrition in the meal, would you justifiably be able to eat this as part of a ‘normal daily balanced lifestyle’!